Inspired by the daggers used by the character V in the film V for Vendetta, this Vendetta Dagger is perfect for cosplay, Halloween costumes, or display. This knife gets you as close as it gets to portraying V without breaking the bank. 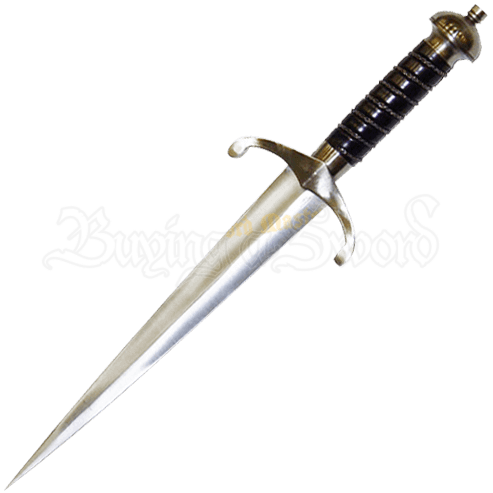 The blade of this dagger is constructed from 440 stainless steel with a ridge down the center. Solid steel is used for the guard, fittings, and handle. The black handle features a genuine leather wrap with a precise wire twist. To complete the design, the pommel features a rounded ornate construction. The included sheath is black leather with a belt loop and snap safety. Even if you are not a fan of the film, this decorative dagger makes a wonderful addition to the arsenal of any fan of medieval daggers.